Mina Holland is a journalist, editor and writer specialising in food, drink and lifestyle. She lives with her husband Freddie Denham-Webb, a composer and sound designer for commercials, film and theatre, and Ernie, their two-and-a-half-year-old whippet. How long have you lived in your home for? We moved in on Wimbledon women's final day 2017, so are approaching 18 months in the area. What drew you to this flat and Crofton Park? We were initially drawn to Crofton Park by the house prices and the transport links. We'd previously lived with Freddie's mum in West Hampstead and â€“ seeing as a writer and a musician are unlikely ever to be able to afford it round there â€“ started looking for areas that were on the Thameslink train line, so we could get to our respective workplaces directly (I'm at The Guardian, on the Saturday Feast section, three days a week, and Freddie's studio is still in NW6). We liked that we could afford a Victorian property with two bedrooms in the area and that there are lots of green space options for the dog. I have to say though that the real clincher that seduced us to Crofton Park was Jones of Brockley; as soon as I knew I'd have easy access to good bread, good cheese and good wine, I was sold on the neighbourhood. Our flat is a purpose built maisonette, occupying the whole ground floor of a double fronted terraced property, with its own front door and garden. All of that was a huge draw. We liked that it had been built to be lived in its current layout, with five equally sized rooms, and that it had a south facing garden, which was in almost constant use over the heatwave summer. It needed a lot of work when we bought it; we were both eager to do a renovation and have the kitchen, bathroom, etc exactly as we wanted them after nearly three years of living with parents. What condition was it in when you took it on and how did you find the renovation process? Everything needed updating. The renovation process was pretty smooth, mainly because we found the most brilliant builder in Fatlum Smajlaj and his team, but also because Freddie and I focussed on different aspects of it, complementing one another pretty well. I drew out how I wanted the kitchen units to be arranged, was pretty opinionated about the colour scheme, and was in charge of the more decorative aspects like tiles, while Fred is pretty obsessive about the details like lighting, switches, inbuilt wardrobes and hooks, which I really appreciate now, but at the time I think I felt life was too short! All of the rooms work together in a calming and aesthetically cohesive way. Did you consciously design it in its entirety from the outset? Not really. We knew we were going to do up as much of it as we could afford at once, but we never approached it thinking it needed to come together as a cohesive whole. I think maybe that happened organically, because it's a straightforward expression of us - the materials and colours we like, our furniture and possessions. 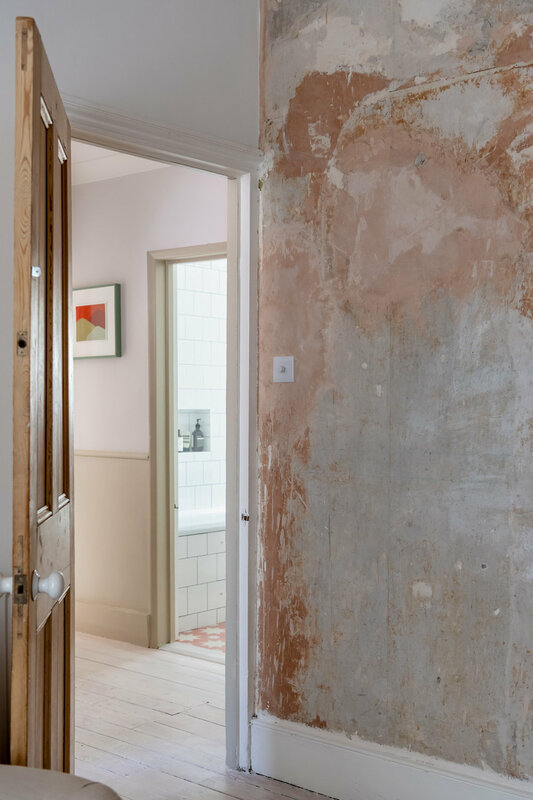 There is a grounded warmth given to the space from the restricted palette of both colour and materials - the raw plaster, concrete, plywood and neutral tones. Can you tell us a little more about this? We wanted to rely on tiles (with which I have a longstanding obsession) and objects like ceramics, my cookbook collection and flowers to introduce colour into the space, so it seemed logical to have a neutral backdrop. Lighter colours also made sense given the limited space - the flat is only 750ft but feels bigger, I think because of the colour scheme we went for. We'd both always wanted a concrete work surface, which was one of only two things we really splashed out on (the other was the bathroom floor tiles from Bert and May), and the raw plaster walls were inspired by Freddie's mum's living room - she never bothered having her walls painted after they were skimmed, and we all love the textured effect and the peachy colour. Our 'statement wall' in the living room was unplanned - when the old wallpaper was pulled off, this was revealed, and again, we loved it. It makes a good backdrop for the aerial photograph hung on it. The plywood was Freddie's idea, the result of obsessive Pinterest boarding and months of lusting! When we found out we could have those units made for a similar price to an Ikea kitchen, it was a no brainer. Given your work as a food writer, what were your requirements for the beautifully executed kitchen? Lots of storage space! I had collected so much kitchen stuff over the years - utensils, pottery, books, glassware, obscure ingredients - which heretofore had been sitting in boxes. I was excited to give them all a home in my own kitchen, and to have easy access to them, but it was very important to us (mostly to Fred) that the kitchen was uncluttered. So good cupboard space was essential. As was a dishwasher, for marital harmony. I was dead set on getting a double sink - my mother's sage advice, so you can wash one thing and drain another at the same time. Plenty of surface space so we could both chop, mix, whatever at the same time. I also wanted a kitchen in which we could just hang out, so we could have a drink with friends while getting supper ready, for example - a working living space, as it were. Which it is: I frequently choose to write in the kitchen over the office, looking out onto the garden as I procrastinate. Being able to step out and grab a handful of rosemary or a couple of bay leaves while I'm cooking still feels like a luxury. Favourite places to eat in South East London? 161 Kirk in Sydenham for small plates and natural wine. Theo's pizzeria in Camberwell - the best pizza in London, and don't even get me started on their aubergine parmigiana. The Camberwell Arms because it is everything a pub should be and more. Ganapati in Peckham for the takeaway of dreams - I love their thali and their parathas particularly. What are your favourite South East London haunts? All of the above, Jones of Brockley, the parks (mostly Hilly Fields, Beckenham Place, Peckham Rye, Sydenham Woods) and Brockley market.